Moscow's fifth wheel back in Soviet times, Lokomotiv spent decades eating the leftovers of Spartak, Dynamo, CSKA, even Torpedo, but in post-USSR Russia they have won more than enough titles and have succeeded enough at international level to deserve, beyond the slightest doubt, a spot on Moscow's football podium, next to Spartak and CSKA. Football Club Lokomotiv Moscow were founded in 1922 and their original name was “Kazanka”, which was how the Moscow-Kazan railway was called. Next year they were renamed “KOR” (Club of October Revolution), which lasted until 1931, when “Kazanka” made its comeback. Since January 1936, the team has been known as Lokomotiv, a name that had the approval of the Soviet Ministry of Transportation, the owner of the club, through the State Railways. There exist some football teams with the name "Lokomotiv/Lokomotive", for example Lokomotive Leipzig, which has a historically background of the teams being associated with the railroad industry. As many football teams, also this one was originally founded by industry workers. Lokomotiv won only two titles in Soviet times, their best finish in the Championship was second, in 1959, but they can pride themselves of winning the first ever Soviet Cup in 1936, a success they repeated in 1957. All those decades that other Moscow greats were winning trophies fighting against each other and also against Dynamo Kyiv, Soviet Union's most successful club, Lokomotiv were struggling to establish themselves in the Top League, being relegated a total of seven times, last one in 1989. The eighties were particularly bad for them, getting relegated in 1980, finally managing to return to the Top League in 1988, only to experience another painful relegation at the end of 1989. Despite their failure, the club stack with Yuri Syomin, or Semin, as he's usually called in the West. A decent striker in his playing days, Semin had taken charge as Lokomotiv's head coach in 1986, when the team were still fighting to return to the Top League. With a small break in 1991, he was meant to stay at the club until 2005, practically two full decades. By the time he left to coach the national team of Russia, his Lokomotiv had earned a place in the country's Top 3, along with Spartak and CSKA. They won their first Russian title in 1996, lifting the trophy of the Russian Cup, a success they repeated next year. In 1998 they started building a name at international level, reaching the semifinals of the Cup Winners' Cup, where Stuttgart proved too good for them, winning in both legs. Amazingly, next season Lokomotiv reached again the semifinals of the very same competition. It was Lazio's turn to hurt the Russians, even though they failed to beat them in any of the two games, drawing 1-1 in Moscow, and 0-0 in Rome. The new millennium brought two more back-to-back triumphs in the Russian Cup, but the best was yet to come; Lokomotiv entered their new stadium in July 2002, they became the first club in Russia to have a truly modern and football-specific home, and they combined that historic season with winning their first Championship title, putting an end to more than 65 years of waiting. With Semin still leading the team from the bench, they went on to win a second Championship in 2004, and reach the last 16 of the UEFA Champions League, where, once again, it was the away goals rule that hurt them, beating Monaco 2-1 in Moscow, but losing 1-0 in the second leg. Alongside Semin, it is Dmitri Loskov, Lokomotiv's iconic number 10 since 1997, who deserves more credit than what anyone could describe for the team's successes. When he left in 2007, he had won everything with them, and maybe most of all, the eternal gratitude, respect, and love of Lokomotiv's fans. He returned to the club in 2010, aged 36, played in several more games until 2013 when he retired, or so everyone thought, since in February 2017, at 43, he returned to his beloved Lokomotiv once again, signing a contract as a player, but also working as Semin's assistant, after the legendary coach had returned to the club himself in 2016. Lokomotiv's beautiful stadium since 2002. 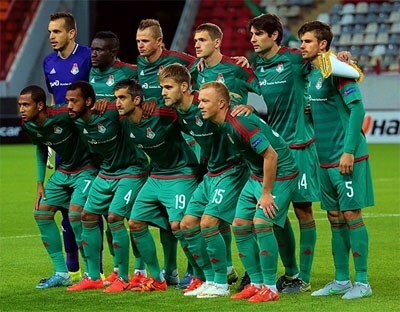 Lokomotiv won another Russian Cup in 2007, and a sixth one in 2015, but in the Championship they have been struggling to finish higher than fourth, something that has happened only once. Even so, they have earned the right to be considered a great among Moscow's greats, among Russia's greats actually, since after 2007, more clubs from other cities have been challenging the Muscovite teams for titles and glory. A big red Cyrillic “Л” (L) is the dominant figure in Lokomotiv's logo, with a green locomotive and the Russian Railways' emblem (at the bottom) also fittingly included. The logo has hardly been changed since 1936 (see an old version to the right), with practically all new touches ever since, having to do with updating the look of the letter “Л” and the locomotive, but not really altering the character of the emblem.